Adding a piece of small equipment to your Pilates routine can make a dramatic difference! There are several common aspects of small equipment: it’s cheap, portable and you get great results when you use them! Below are the top 5 pieces of small equipment and why you should have them! Well, if you’ve attended either our studio sessions or our small group courses of evening Pilates, you will know the diversity and intensity of the small ball!! Placing the ball between either your hands or your knees allows the adductor muscles of the hip and shoulder/chest to work. Great if you want to tone your inner thighs and perk up your pecs! The ball can also be placed under the sacrum so that the body lies on an unstable base. This give the abdominals the opportunity to work extra hard to make sure the pelvis remains level and still! Though in reality, the pelvis is never completely still whilst it’s on the ball! Exercise bands, also known as resistance bands, stretch bands have been around for quite a while. With their roots in therapy, they are now very popular in many fitness classes. The can be used for both stretching and strengthening muscles. The ones we use in class are typically longer than ones given by therapists, and come in a variety of strengths depending on what you want to achieve. There are two versions available: those containing latex, and those without. In the main the bands are held at the ends, but small clips can be used to make a connected loop, which allows the band to be placed around the ankles/knees without having to hold onto them. The are very versatile and can be used for stretches as well – they act as an extension to your arms, so you can open the joints without putting strain on them. If you travel a lot, having a band in your case won’t take up any weight, or will it take any space. Whether a simple dowel, weighted bar or small hand weights, adding weights to your Pilates routine will increase your muscle size and shape. Just remember to keep the weights light – you don’t want bulging muscles! Depending on the weight, they add strength and coordination challenges to a workout. In Pilates, we typically choose lighter weights — just enough to add tone but not enough to throw off the alignment or take attention away from the focus on the core. Usually constructed as flexible metal rings, magic circles are light-weight, inexpensive, and very useful. They are typically used to add a little strength challenge to a workout. They are also helpful aids in giving the body neuromuscular feedback. They are very portable and versatile – they are increasingly popular in Pilates classes. The magic circle is provides gentle to moderate resistance in an exercise. They also give the body feedback as to where it is in space and which muscles are being used. The magic circle is not intended to provide a big resistance challenge. When using the Circle – you don’t need to choke the living daylights out of it – it should provide some resistance! These are the larger, more common balls you may have seen in hospitals and therapy centres. Exercise balls were certainly not invented by Joseph Pilates and they are not considered traditional Pilates equipment, nevertheless, the fitness ball has been heartily embraced by much of the Pilates community. The secret to the success of this equipment is due to its instability when you sit on it. 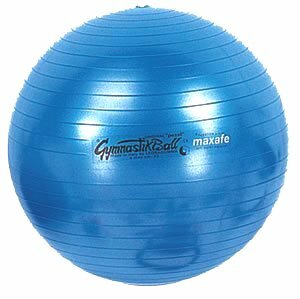 The wobbly nature of a ball makes it quite a balance challenge when you try to sit or lay on one while exercising. You are challenging your balance which means you have a great opportunity to test core strength using the powerhouse and stabiliser muscles. You will find that even having just the hips or legs on the ball, while the rest of the body is stable on the mat, is an increase in difficulty. Sit on the exercise ball at work to keep the abdominal muscles and spine active – a great alternative to the office chair! Stretch: balls are great to drape yourself over – front or back. Play! But keep it away from dogs who might burst it! Every home should have at least one piece of small equipment! Keep your workouts fresh, challenging and exciting by using a small piece of Pilates equipment! Having bad posture, stiffness of my neck and painful hip joint. I found the bands strengthened my whole body, both the blue and purple ones.